Cruise through beautiful countryside passing through deep wooded cuttings and embankments that give views for miles. In some sections you will only pass though a handful of hamlets, but they all seem to have convenient pubs if you are in need of a break! It is so rural and remote that you can get lost in the peace, disturbed only by a nosy herd of cows as you cruise by!! There is an attractive round Toll-keepers watch tower just above the lock, with a small canal shop on the ground floor. 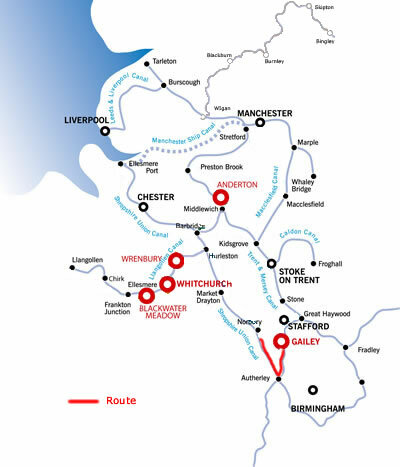 The canal is very twisting through the countryside passing a very busy marina at Hatherton , the Fox & Anchor Inn is canalside at bridge 71 and as it is 2 hours cruising to here it might be a good place to moor up for the night. Continue south to Autherley Junction, the M54 makes a brief intrusion but you soon pass under & away from from the rumble of traffic. The Shropshire Union canal, or The Shroppie, starts the journey at Autherley Junction (turn sharp right) in the outskirts of Wolverhampton, known to the working boatmen as “Cut End” due to it being where the Shroppie met the much older Staffordshire and Worcestershire Canal,Autherley Junction was once a busy place with workshops, a toll office and stables, today Autherley has a boatyard with a hire fleet and a club house. Many of the original buildings still exist and it is home to Bridge #1 on the Shroppie which is an original design by Thomas Telford. There is also the original shallow stop lock where Sam Lomas used to control boat movement and issue toll tickets. The lock has a drop of 1 inch, meaning no drop at all, so was purely used for Lomas's financial motives. Autherley is very attractive and full of canal history and it is worth giving yourself some time to look around! We soon leave Wolverhampton behind and head northwards through a series of rocky cuttings, passing a disused airfield, a boat club and then traversing under the M54 motorway which is one of the only main roads that the canal encounters for around 50 miles when it reaches Chester. Chillington Hall, close to the village of Brewood (pronounced Brood), is home to the “Fancy Bridge” named by the workers who built the Shroppie. Powerful landowners demanded grand and ornamental bridges where the canal crossed their properties and this is a fine example of such work. A tree lined avenue crosses the canal here leading up to Chillington Hall which is now a venue for Weddings. Just a short distance upstream from Chillington Hall is Brewood and you will find shops, pubs and restaurants close at hand and there is also a boatyard all of which should meet any of your requirements. Just beyond Brewood you will see the Belvide Reservoir which supplies water for the canal. A very short distance from there is a cast iron aqueduct, the Stretton Aqueduct, which was built in 1832. It is used to cross the A5 Watling Street and take you onwards to Wheaton Aston where you will find the first lock on the Shroppie other than the stop lock at Autherley. The Wheaton Aston lock is unique by way of being the only singular lock on the canal route as the other locks are bunched together in "flights". This made for quicker working by the boat people because locks could be easily prepared in advance of the boats. At Wheaton Aston you will find a waterside garage that offers some useful facilities for boaters and a canalside pub. Wheaton Aston also has a few basic supplies. Once past Wheaton Aston you are headlong into beautiful countryside passing through deep wooded cuttings and embankments that give views for miles. During this section you will only pass though a handful of hamlets. It is so rural and remote that you can get lost in the peace, disturbed only by a nosy herd of cows as you cruise by. You will pass through Cowley Cutting, a cutting that is deep, narrow and wooded. This section was originally intended to be a part of the Cowley Tunnel which takes you into Gnosall, but the ground was unstable so they opened this section out and made it the cutting it is today, and naturally it leads you straight into the tunnel which opens out into Gnosall, which is convenient for stocking up on supplies. or stopping for a pint and a bite to eat and a good place to moor for the night as it will have taken you about 6.75 hours to here. Onwards from Gnosall you find yourself heading towards Norbury Junction passing over the infamous Shelmore Embankment. It took 500 men and 50 horses 6 years to build the mile long embankment which is on unstable land. This was the last section of the canal to be completed and the reason for Telford to never see his final waterway opened. Troubled from the start this section had to be repeatedly repaired. Today it is covered in mature trees whose roots help with stability and there are also flood gates at either end of the embankment in case of a breach. At Norbury Junction the Shroppie used to branch off to the Shrewsbury Canal via the Newport Branch and both of these are proposed for future restoration. In the one section of the Newport Branch that is still accessible there are moorings and a dry dock. 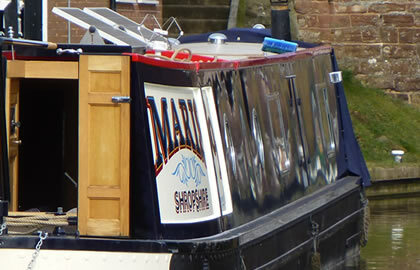 Norbury is full of facilities including a British Waterways office and maintenance yard, a large pub, a café and a boatyard with a hire fleet and plenty of moorings. The Norbury area is very popular with walkers as it is a very pretty place with lots of wildlife. Expect it to be busy on a sunny day! Heading north from Norbury you go through the mile long Grub Street Cutting known for the double-arched bridge which supports a telegraph pole. Turn around in the winding hole here & begin your journey back to the marina. Moor at Brewood, there are 3 pubs in the village & supplies & takeaways. It is 6.75 hours to here. it is 5.25 hours back to Gailey so take a leisurely trip back.